The Opinionated About Dining survey has yielded a list of the Top 100 U.S. Restaurants in the U.S., drawn from over 70,000 reviews submitted by over 3,000 participants — including many food bloggers. 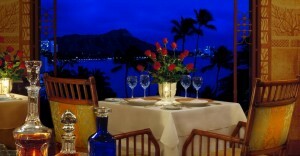 And from those reviews, lead author Steve Plotnicki has separately released a list of the best restaurants in Hawaii. The Opinionated About Dining approach to rating restaurants relies on tapping into the experience and opinions from diners who are passionate about where they eat and who describe how strongly they would recommend a restaurant and why. The methodology further gives weight to different kinds of restaurants and survey participants based on factors such as price point and number of restaurants reviewed. The surveys that form the basis of the ratings are open to the general public and can be accessed online. Steve Plotnicki is the author of the Opinionated About dining blog, and the author of “Opinionated About U.S. Restaurants 2011,” He is also the organizer of a number of theme-based dinners that he hosted with Chef Tom Colicchio at Craft, New York and Michael Cimarusti at Providence, Los Angeles. “If these survey results have shown me anything, it’s that 2012 is and will continue to be an incredible year to dine at some of the most progressive and thoughtful restaurants in recent memory,” says Plotnicki. To participate in the restaurant rating survey or for more information, visit www.opinionatedaboutdining.com. Plotnicki’s passion for food has long been an intrinsic part of his life, if not always his career. A native New Yorker, he was a successful guitarist and songwriter before co-founding Profile Records in 1981. Among the artists Plotnicki developed for the label were groundbreaking urban and hip-hop acts such as Run-D.M.C. As his business took off, so did his passion for food, which was further influenced by traveling around the world and visiting a number of acclaimed restaurants. Plotnicki worked in the music and television industries for the next two decades—all the while continuing to expand his culinary vocabulary and experiences. In 2003, he launched a discussion forum, which morphed into his “Opinionated About Dining” blog, a project that established him as one of the most prolific early food bloggers. Initially conceived as a way to share information about his dining experiences with other enthusiasts, “Opinionated About Dining” continued to evolve and attract readers. In 2007, Plotnicki developed a formal survey for readers and fellow diners publishing in 2008 a 56-page booklet on the 100 best restaurants in North America and Europe. After this experience, Plotnicki further refined his surveys with the aim of creating a guidebook that would inspire a community of people for whom dining is a true passion.